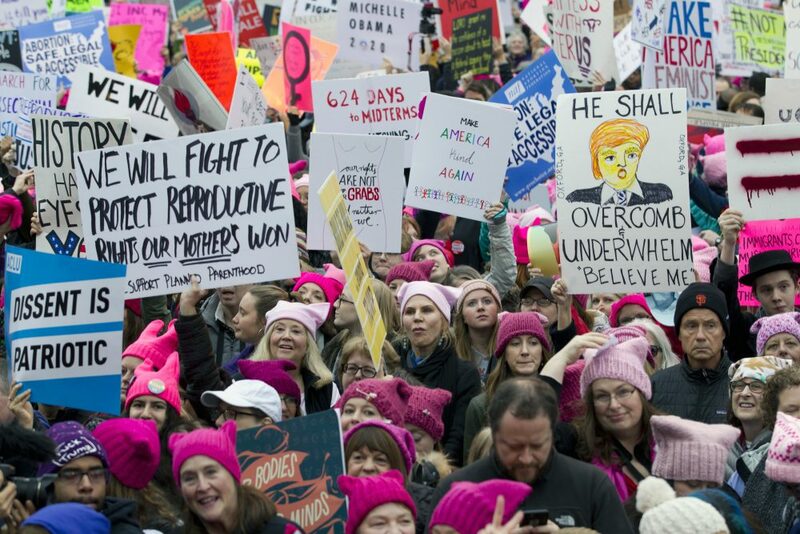 Women march on the first full day of Donald Trump's presidency, Saturday, Jan. 21, 2017 in Washington, D.C. Photo by Jose Luis Magana/Associated Press. Does Trump’s election and its aftermath mean that the U.S. government is experiencing a crisis of legitimacy? In order to address that question, we need to understand how citizens determine whether a government is legitimate or not. What qualities do citizens use to assess the trustworthiness of their governments? 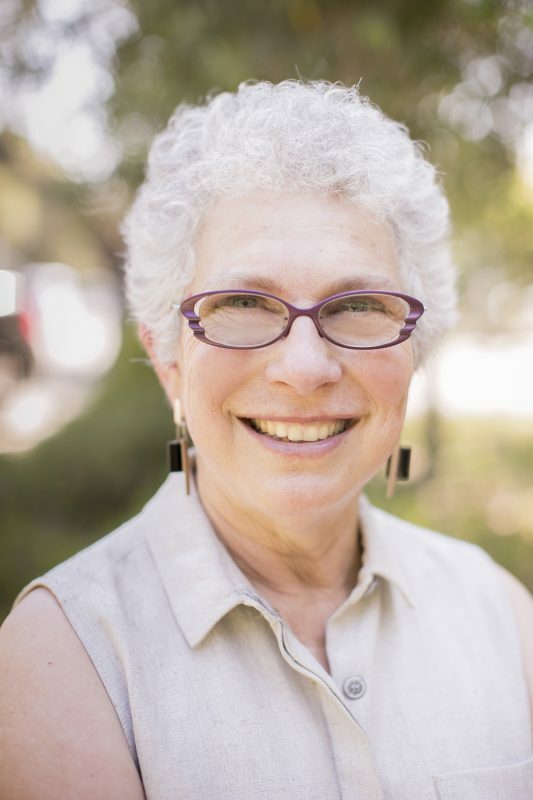 Zócalo Public Square asked these questions of political scientist Margaret Levi, who has investigated the conditions under which people come to believe their governments are legitimate and the consequences of those beliefs for compliance, consent, and the rule of law in North America and other parts of the world since the 1970s. Her research continues to focus on how to improve the quality of government. Levi is the Sara Miller McCune Director of the Center for Advanced Study in the Behavioral Sciences and professor of political science at Stanford University, and Jere L. Bacharach Professor Emerita of International Studies in the Department of Political Science at the University of Washington. Margaret Levi. Photo by Nikki Ritcher Photography. Q: How did you first get interested in studying government legitimacy? A: It well predates my being a trained social scientist. My mother was taking us on marches for civil rights when I was just a little teeny girl. I think the issue of when government is serving its populations—and which part of its populations—has always been a question that fascinated me. That morphed into studying the question of under what conditions people will resist government and under what conditions do they find it legitimate. Q: You did research on how soldiers go to war for a government. When we talk about government legitimacy we have this idea that it’s a big monolithic thing, but in many ways it’s a very intimate thing between each individual and the government. A: The research was on young men who were choosing whether or not to volunteer for military service at the beginning of World Wars I and II in the U.S., Australia, Canada, England, and France. Some of them were also deciding whether to allow themselves to be conscripted when it was no longer a question of volunteering. That’s a time when the population is being mobilized to pay a very high price to show their allegiance to the government. Yes, it is an individual decision but … it is one very much informed by one’s social network and the community in which one lives. If we go back to my interest in [the] civil rights [movement], parts of the population were happy with the status quo and thought everything was hunky-dory, and parts of the population were literally oppressed and suppressed and didn’t think things were good at all. You see a huge difference, for example, between how Francophones in Canada reacted to the request for volunteers and how Anglophone Canadians responded. The Anglophones were far more likely to respond positively and the Francophones were more likely to respond negatively. The reason had to do with their feelings about how well the federal Canadian government was serving them and how trustworthy it was. The Francophones had been promised bi-lingual education and general respect for their language, but in some provinces that didn’t occur. Francophones were also worried—and reasonably so—that military orders would only be given in English, which not all of them spoke. We can see this kind of problem occurring all over the world: Some part of a population feels like they are not getting what they were promised by the national government. We can see that in some of the midwestern and southern towns that supported Trump, where white populations feel let down by the federal government. We can see that in some black populations and some urban areas, where people have gotten promises for many, many, many decades about fair police treatment and fair access and equality of opportunity that they don’t feel have been delivered. Before I looked at conscription I looked at taxation. Of Rule and Revenue (published in 1988) started with trying to understand why tax systems look so different across countries and across eras. I started in ancient Rome and ended in contemporary Australia. I thought my answer was going to have to do with economic transaction costs. But it turns out that the major issue was political transaction costs. That is, no ruler can really force everyone to pay up. They can’t have a fed under every bed, and it doesn’t matter how much they use the military or the police. They need to get what I call “quasi-voluntary compliance,” where people feel like they have some obligation to pay but they will do so only under certain conditions. Those conditions include the trustworthiness or reliability of the government. There has to be some confidence that the government is trying to keep its promises. There has to be some belief that the process by which the policy was made is fair according to the norms of the place, which can vary a lot. And people have to believe that government will enforce the rules against those who don’t comply; no one wants to be a sucker, one of the few paying taxes or signing up for military service in a full-blown war. One example from Australia in the 1960s and ‘70s was that the tax system began to fray in part because of a supreme court justice who’d been a tax lawyer. He began to create all sorts of loopholes for all kinds of relatively well-off people. As a result, the government allowed rich people to get away with not paying taxes, and they faced a tax revolt from everyone else. The whole system had to be reconstituted to be more trustworthy: first to be more equitable and secondly to ensure that everyone paid their share given a better set rules. 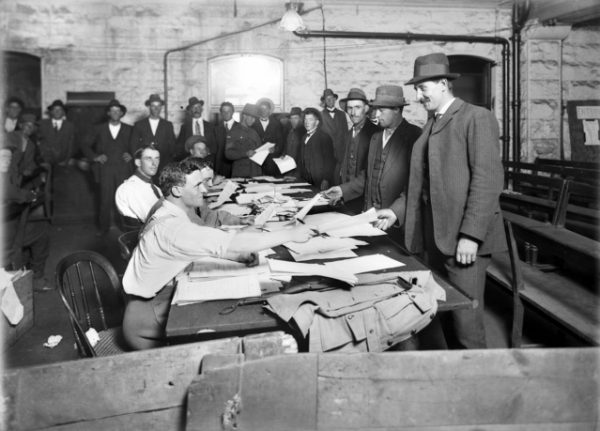 Australian men at the Town Hall in Melbourne enlisting for service in World War I.
Q: It’s an interesting thing: We might think that democracy happens by dropping off a ballot, but it actually happens in these struggles over taxation and conscription. Your research suggests that one of the hallmarks of democracy is this ongoing struggle. A: That’s right. That’s what democracy involves: an ongoing struggle, ongoing conversation—that reconfiguration of norms and ethics and values, who is included, what the government’s responsibilities are, what the processes are. You want to feel the government is actually trustworthy and fair and that you are, as a citizen, contributing. And that you’re not going to be alone. I really do think that the feeling of being a sucker is part of what’s going on in the U.S. Feeling betrayed or feeling suckered and feeling like you’re doing your share and others are not. When that begins to get too rampant, whether it’s right or wrong, it is really important. Q: One of the points you’ve made is that mudslinging and skepticism are pretty much hallmarks of democracy. The fact that there’s a lot of noise doesn’t necessarily mean that the government is suffering a crisis of legitimacy. Where are we now? A: That’s the question. Before the election we were seeing people claiming in surveys and on media that they distrusted government, and we read and heard analysts arguing about how important that distrust would be in affecting votes. But there wasn’t evidence of much non-compliance or demonstrations against government; people weren’t really taking to the streets. What we’re seeing now is something quite different. We’re seeing a lot of people mobilizing in ways that go well beyond the vote. We’re seeing big demonstrations. They’re anti-Trump, but I think it’s democratic, with a small “d.” It seems to be from people who want certain kinds of government action. It’s a pro-government, but anti-this-particular-administration, mobilization. That’s why it’s really not the Tea Party. The protests have some similarities in form, but the substantive concerns are vastly different. These protestors are really talking about what our education system is going to look like, what social security is going to look like, what health is going to look like. We want to protect government; we believe in climate change and want the government to act to do something about it. There’s a lot of government in it. It’s not anti-government as an institution. There is a population that felt left out and voted for Trump and are very angry. But that portion may not even be half of the people who voted for Trump. … We’re not talking about the mass movements that created Perón or created Hitler. Q: You said in one of your interviews that we’re still governed by institutions designed in the 18th and 19th centuries, and then tweaked some in the 20th century. Now we’re at an inflection point where we must outline better economic and political practices that suit the world of the 21st century. Are we experiencing the spasms of the inflection point right now? A: Yeah, I’m in a lot of discussions of exactly that … There’s a set of short-term questions that have to be confronted as well as some really significant long-term questions—which is frankly where I’m putting most of my energy because of my own particular capacities. The short-term issue about our democratic institutions is to make sure that they hold and that, depending on your partisanship, we change this particular administration or make it ineffective as soon as we can. Those are the short-term goals. The long-term ones are really big. I don’t think we can take our eye off [them]. Trump and Brexit didn’t happen in a vacuum. They are reflections of some fundamental flaws in the way in which democracy has evolved and our institutions have not. There really needs to be some rethinking about how a democracy is affected in a world that no longer is a group of white patrician men basically running the show. Less than half of the eligible population voted in this last election. I have my own doubts whether this election was about populism. There is a population that felt left out and voted for Trump and are very angry. But that portion may not even be half of the people who voted for Trump. We’re talking about a very small portion of the population. We’re not talking about the mass movements that created Perón or created Hitler. Populism is an issue that we have to interrogate. We have to really think where the populations of various countries are, why they have the beliefs they have. The media, our sources of information, the kinds of civic education we need to provide: All of those things are really up for grabs. The false news issue is not really the issue. The issue is how people come to believe the things they believe and under what conditions those things can be changed. How do we get to a world in which people can agree on some basic facts? And create institutional arrangements that allow people to find their commonalities and to argue about their differences—learning from each other and agreeing to disagree, in some cases. 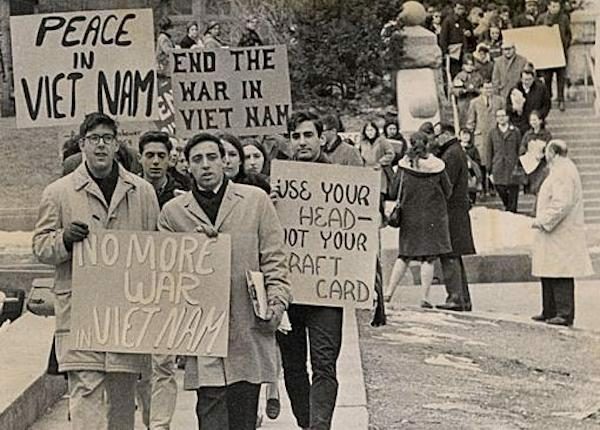 Student protesters marching down Langdon Street at the University of Wisconsin-Madison during the Vietnam War era. Photo courtesy of UW Digital Collections. Q: If you were thinking ahead, maybe 40 or 50 years, can you describe one institution that could be really dramatically changed? A: One thing that we really need to rethink is our education system. I don’t mean just making sure everyone can read and write. We have to find ways to enable people to think critically, to be nimble, to acquire certain skills. We have to give people the kind of information that enables them to make government work for them. We don’t need to know absolutely everything that all of the various agencies do, but we should know how to find out what’s going on when we need to. That would be part of creating a population that is able to argue about policies but not think that those who disagree are bad people. To have an actual discussion and recognize facts. That’s one institution that I would change … It might be a really major overhaul rather than a reform. And you know that Congress is not working very well … We need to create a set of incentives, positive or negative, to get people to be our representatives—to serve the interests of their constituents, but also to be focused on the national interest. And to make those tradeoffs at the appropriate moment. There were all these little rules that turned out to have huge consequences. Pork barreling and earmarking actually served a purpose of enabling representatives to serve their districts. We have to redesign the ways of Congress so that they really can represent their constituencies and be part of a national conversation that serves the larger general interest. The Senate was designed to solve a problem in creating democracy—how to get states to buy in if they’re tiny. So it’s a problematic institution in terms of representativeness. Whether we can ever change the Senate is a very open question, but if we raised these issues we may be able to find ways … institutionalizing new norms, new rules, new procedures, that bring people together rather than constantly push them into camps. This relates to a book I wrote with John Ahlquist, In the Interest of Others. What we’re really struggling with is, how do you create an expanded community of fate? What kind of institutional arrangements bring out people’s willingness to recognize others, strangers, as part of their community? We know about the ways in which people resort to sort of tribal communities. We wanted to think about the ways in which you get people to think in broader communities. John and I established proof of concept that it can happen by looking at labor unions, which are in fact mini-governments … We found how rule changes made a difference, how different constitutions made a difference. Looking at longshore unions is not exactly looking at the U.S. government, but it’s still a proof of concept, showing that it’s actually possible to build a democratic set of institutions that can evoke from people their best selves. Q: Yeah. If institutions are hitting this inflection point—in a different kind of capitalism, a different kind of political culture—we’ll be searching for new structures and new recipes. A: We really need to put our heads together and do that. There might be people out there with some of the answers but we have to get them together in the same room and start figuring it out. I don’t think this is something that will be done at Davos. We need a lot of different voices in that room. It cannot be just corporate leadership and it can’t be just government leadership. It has to be serious academics; it has to be journalists who have been in the trenches; it has to be folks from various communities. There are a lot of voices that need to be heard as we think through what institutions we need to have a democracy that really thrives and a political economy that really thrives. Margaret Levi is the Sara Miller McCune Director of the Center for Advanced Study in the Behavioral Sciences and professor of political science at Stanford University, and Jere L. Bacharach Professor Emerita of International Studies in the Department of Political Science at the University of Washington.